It is the summer of 2009 and an unbearably hot day. My mom is walking in front of me, giggling and talking in Chinese with the cousin she hasnâ€™t seen in more than a decade. Every couple of minutes, she turns around to look at me, my brother, and my dad, to point out places from her past. 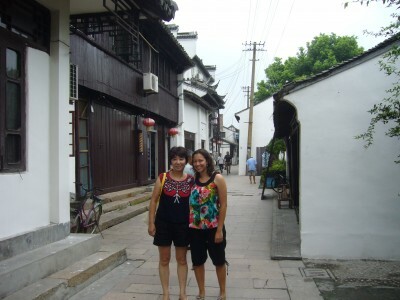 My mom and I walking in Liantang. My mom has brought us to Liantang, China, her grandmotherâ€™s hometown and where she spent the summers of her childhood playing with her cousins. Every summer, she would take a bus about 25 miles from her home in Shanghai to Qinqpu and then a ten minute boat ride to Liantang. For the first few years, her parents would take her, but starting at the age of 10, she would make the journey by herself. As we walk along the riverbank, she points to the river and says that she used to spend hot summer afternoons swimming in the river with her cousins. Being the only one who couldnâ€™t swim, she was given a wooden tabletop to float on. From the start, itâ€™s clear that this is an entirely different world from the one I had grown up in. The river where my mom swam as a child goes right up the middle of the town with streets made out of gray granite stone butting up against the riverbank. The streets are so narrow that a car would not have fit. On either side of the river, there are tiny houses made out of wood. My mom takes us in one of them. Itâ€™s the house that used to belong to her uncle and where she would sit on the roof at night with her girl cousins to chitchat and tell ghost stories. The house is a 12-foot square room with an attached three square-foot room that serves as a closet and a bathroom in the form of a plastic pot used as a toilet. Walking around Liantang and listening to my mom point out places from her childhood and tell us stories from days that have long since passed, I try to imagine what life would have been like in this small town. I had just turned 18 and was weeks away from leaving home for the first time to go to college. It was an exciting time for me. I had just experienced the best summer of my life and I was excited to go to college and experience more of the world. Growing up in Deerfield, a suburb north of Chicago, I had a very privileged, yet sometimes isolated, childhood. It seemed like nobody knew what life was like outside of Deerfield. Having a mom who was Chinese and would bring us to China every couple of years, I felt like I had a better grasp of the outside world than my classmates. Growing up on my momâ€™s stories of life in China with little food and even less freedom due to the Cultural Revolution, I knew how different life could be. I donâ€™t think that as a child, I was able to understand it. The last time I had visited China, I was only 14 years old. At the time, I could see that China had a very different culture, but it seemed like life in China was the same as life in the United States. Not so for me when I visited again during the summer of 2009. From the human trafficking of children on the streets of Shanghai to the lack of indoor plumbing in Liantang, I didnâ€™t understand how people could be happy and enjoy life when it seemed that they had nothing. Yet, from listening to my mom talk about how much fun she had during the summers, floating in the river, catching freshwater eels in the rice fields, and chitchatting all night with her cousins, I could see how special these times were to her. Even though they did not have any toys, they had each other and were able to create their own fun. This was possibly the happiest I had ever seen my mom. She seemed happier to be in a place where she had nothing than she was in America where she had so much. She came to the United States in August of 1988 to do post-doctorate research at Purdue University and to see the world. She travelled by plane from Shanghai to Tokyo to Los Angeles to Denver, and finally to Indianapolis. She came by herself, carrying all of her possessions in two suitcases. Years later, she told me that she was planning on staying in the U.S. for only a couple of years, just to do her post-doctorate research. But it turned into a lifetime. I thought she was going to talk about all the happiness and time with her family that she had to sacrifice by leaving China and moving to America. But it seems that life takes on a journey of its own.Â No regrets.Â No sacrifices. Just fate.